This post by Nancy McAleer of ﻿﻿﻿﻿AMI Home Rental﻿﻿﻿﻿ is designed to ​better connect with your guests ahead of arrival. Nancy is also the Co-Founder of Florida Rental By Owners an online vacation rental listing website, designed to allow owners and managers full control advertising of their properties without the fees associated with 'Big Box' style OTAs. In the past 5-years, I’ve seen a huge shift in the vacation rental industry. Guests are expecting more and more out of a vacation rental reservation. I call it "the Ritz-Carlton effect." Gone are the days of a guest thinking a vacation rental is great because it simply offers bath towels and linens. ​As hosts, this gives us no option but​ to ramp it up. Guests are searching for rentals that have over and above the basics. This is what lead me to create one of my most successful marketing campaigns based on nurturing the guest before they check-in. Why ​Does This Campaign Work? ​The Incoming Guest Marketing Campaign can be created in any format you wish, using any different type of app or touch points relative to your target client. I choose to send my guests 3 warm-up newsletters with clickable information as well as call them on the phone the day of check-in to ensure they are all set for their vacation. This does require an actual human to call not a pre-programmed automated text. The reason I do call the guest directly on the phone is to start a one-on-one relationship with them. This increases their affinity to me, increases their respect of my home contents and increases the opportunity to manage guest issues quickly, like maintenance items/damages from previous renters. ​Matt's Note: I got to experience this "Nurture" sequence first hand when we featured Nancy's property on A Sense of Place: Anna Maria Island. It definitely makes a difference. After ​the guest departs I have another Post Stay Campaign that I run that’s geared towards getting guest reviews and solidifying repeat bookings, but that’s a topic for another day. 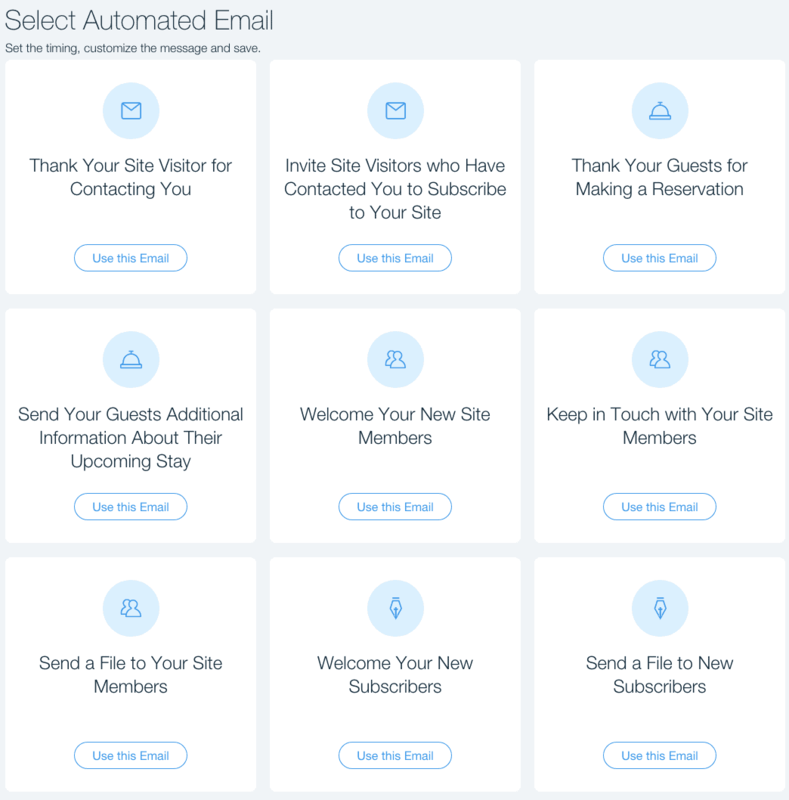 Let’s focus on the Incoming Guest Nurture Campaign to get you started. To do this project, you can use your email marketing tool or a third party app like WIX Shout Out, Constant Contact or MailChimp. For the more advanced folks, this can be easily automated with most booking software. Note: Be sure to get your guest’s opt-in permission before sending them newsletters as it violates the email marketing regulations in relation to spam and newsletters if you don't. I send my newsletters through an automated email marketing plan on my WIX ShoutOut subscription. This is associated with my WIX website. As a side note, I love WIX because it’s a really user-friendly drag-and-drop theme app, where you don’t need to understand website code to make one. All the plugins I need are available within WIX ​where I simply have to pick and choose which one to to add to my ​email automation. To have a successful WIX website you just need to have knowledge of what items ​to include that are really important to a vacation business, how to edit both desktop and mobile views, and how the basics of SEO work (in general and within the WIX editor). Some of these pages have a Call to Action, like booking an activity or a making a reservation. This type of content is great for SEO and you can use it over and over again in many different ways (ie: answering questions on social media platforms which drives new traffic to your website). Here is an example of my first newsletter email that goes out to my booked guests immediately upon creating a reservation. Include information from any question that has been asked by a traveler more than twice (this advice I took from fellow Inner Circle member, David Angotti, relating to anything you do more than twice needs to be automated). E​​​xamples are questions about local grocery stores, caterers, guides...etc. ​An example of ​this and ​my remaining newsletters can be accessed in the Inner Circle. ​An example of ​this and the remaining newsletters can be accessed in the Inner Circle. Inform ​the guest of any maintenance issues that may have arisen. It’s best to let guests know ahead of time so that you can avoid unhappy surprises. ​An example of ​this and the ​other newsletters can be accessed in the Inner Circle. Real Life Example ~ I recently had a pretty serious situation where one of the docks at my home was badly damaged and unusable for several days. The dock and waterfront is the primary reason why guests love this home and book it! ​But because of ​this Incoming Guest Nurture Campaign, I was able to deal with the problem in a way that the guest was already ‘on my side’ because we had built up a relationship through my newsletters and phone call. I let him know about the issue before he arrived at the property to manage his expectations, there were no surprises. The guests that were affected trusted me to handle the problem professionally and as quickly as I could and most importantly knowing that I would be treating them fairly in a way that they would still walk away happy. This guest left me a 5-star review and has already contacted me to book again! Sweet!!!! ​My guests love this information and professionalism and the proof is in my email stats, reviews and repeat bookings. In fact, I’ve had to turn away repeat guests due to lack of supply...time to invest in my next vacation rental! ​Note from Matt: With the help of David Angotti, Nancy and I took something of a deep dive into these statistics and we concluded that while a) ​they are super impressive (they blow ​traditional email marketing stats out of the water), ​what's more important is b) that they are evidence people really love ​this incoming guest nurture sequence and find it incredibly useful. The point here when you go to implement this technique is not the quantitative ​result but the qualitative ​outcome, that people ​appreciate ​and engage with your work. ​My guests love this marketing campaign because it doesn’t feel sales-y and they get loved-up and happy from the moment they book one of my vacation rentals to the moment they depart. They often leave information relating to this campaign in their reviews. Having tried many different campaigns in the past I’m now in the stage of really nurturing my business where my repeat guests are booking 2-years in advance just to get back into my vacation rentals. ​This is the one simple marketing campaign that you need to put into practice TODAY to get more 5-star reviews and bookings! Once you have completed this Incoming Guest Nurture Campaign start a “Post Stay - Nurture Campaign” to solidify those repeat bookings. Remember to send it to them upon departure, you only have up to 8-weeks after they depart to take advantage of their ‘Happiness High’ period.